Gentle, effective help for emotional and behavioural problems, naturally. Used by vets, trainers, behaviourists & people with their pets for over 25 years. ​100% natural ingredients. Simply add to food, water or treats. Need help choosing the correct Pet Blend®? No artificial colours, flavours or preservatives. 100% chemical-FREE ingredients. For any taxing, shocking, frightening or distressing event. 'On the spot' help before, during of after any situation that makes your pet anxious. A handy natural pet-calmer for all animals. Simply add drops to treats and offer to your pet. 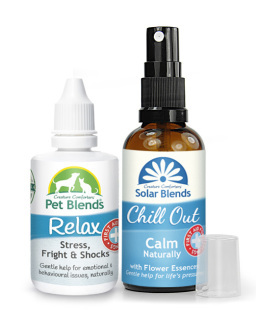 Your pet can remain alert and active - the Relax Blend helps ease the stress. 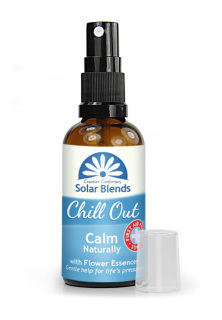 Blended to help gently aid a natural calm. ​No artificial colours, flavours or preservatives. Simply add drops to treats. For Separation Anxiety and for animals who are pining, bereaved, neglected, lonely or suffering from anguish or homesickness. 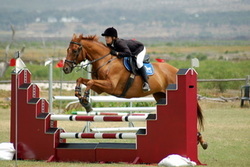 Also used for animals who are re-locating or who need help adapting to new or unfamiliar circumstances. 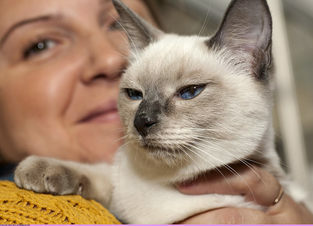 Essentially for animals who are missing their loved ones & companions or who are having difficulty adjusting to changes. For animals who are highly-strung, unruly, over excitable, frisky, attention seeking, erratic, unfocussed or uncontrollable, generally as part of their temperament or character. 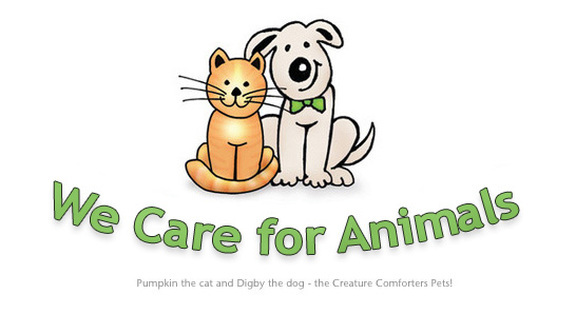 For animals who are timid, nervous, submissive, spooked, clingy, over sensitive or insecure, generally as part of their temperament or character. Blended to help gently aid natural confidence. Give 3-4 drops, 3 times daily. Give 5-7 drops, 3 times daily. Give 10-12 drops, 3 times daily. Also add a few drops to the animal's general water supply each time it is replenished. See instructions on bottle label. Indication: Used to help reduce stresses and anxieties. Directions: Add drops to treats and offer to your pet. During times of stress repeat every 10-15 minutes or as required. You can also add a few drops to their drinking water. TIP: For any upcoming event (eg fireworks, travel, dog show, gymkhana etc.) give 3 x daily for a few days, prior to event. Shake before use. Store in a cool, dry place below 77 ̊F. Keep out of reach of children. Keep away from eyes. Gentle, natural and easy to use. 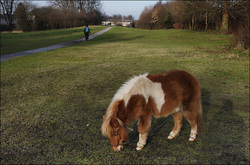 Suitable for all animals, large or small, young or old. The Pet Blends® don't have to be given forever! Usually one or two bottles, given in succession, is often enough to improve your pet's behaviour sufficiently, over time as the bottle is finished. ​Most owners observe improvement after administering one complete bottle (one bottle per animal). Many animals, particularly dogs, will also benefit from using the Pet Blends® alongside professional training techniques plus a good healthy diet, rewards for good behaviour and plenty of exercise. Occasionally some animals may return to their old ways (their unwanted behaviours) over their lifetime. If so another course of Pet Blends® can be given. Some animals may benefit from a Personalised Blend - especially if they have complex problems requiring individual attention (see below). 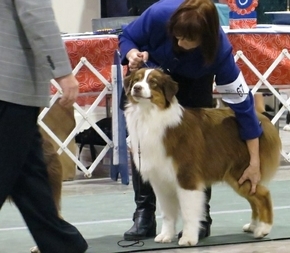 For any animals who don't show sufficient improvement from taking their Pet Blend this may be for a number of reasons, for example; the choice of Blend may not be quite right for that animal’s problem, or the animal may additionally benefit from a change in circumstances, handling, environment, training etc. Furthermore, some animals may instead require a specially-made Personalised Blend for their individual problem. 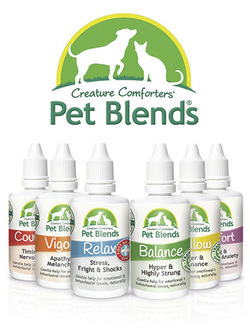 "The Pet Blends are an excellent complementary product. 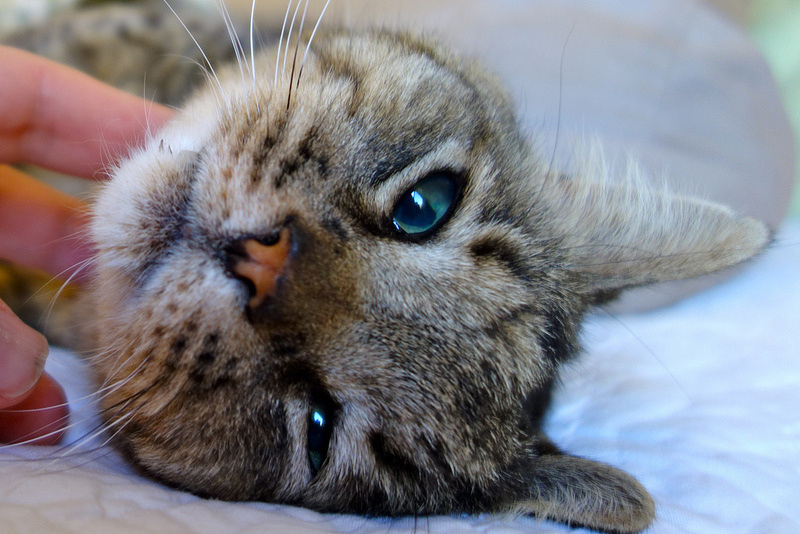 ​I use them for managing behavioural changes and treating ageing animals. I recommend them for behavioural therapy"
'Hibby' has had a complete turn around from a very miserable, depressed and sad dog. He has regained his zest for life. Once again - so many thanks for putting the wag back in his tail! "We highly recommend your Blends ... Quite amazing!" "Great and very effective item. Reassuring for my rescue Labrador. I am writing to tell you how pleased I am with your 'Comfort' Blend for pets. My dog has recently had pups and as well as the 'Relax' Blend (at birth) all the pups were rehomed with a bottle of 'Comfort' [to help with adjusting to new home/owners]. 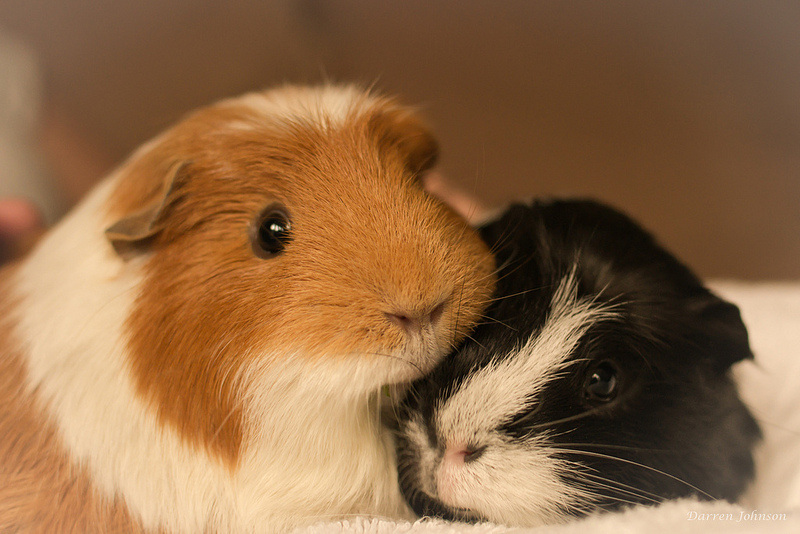 They have all settled into their homes extremely well, and are becoming confident, happy animals - Thank you. "Great advice, arrived next day, working already! Cat will roar instead of meow next..."
This blend has been greatly beneficial for training animals with fear. This is a fantastic product. We buy it on a regular basis and have noticed massive improvement with our two dogs. It really is a wonder product!! ... Have been using your Pet Blends 'Mellow' for quite a while now for our two unruly Saint Bernards! I think its a fantastic product. We are giving it to a Newfoundland and a Shih Tzu, so you can see, we get through it quite quickly. Thanks again for the great product. "Thanks for your help. After taking these drops I showed my dog and she actually won her class." Answer: It usually takes between 3-6 weeks to finish the bottle. 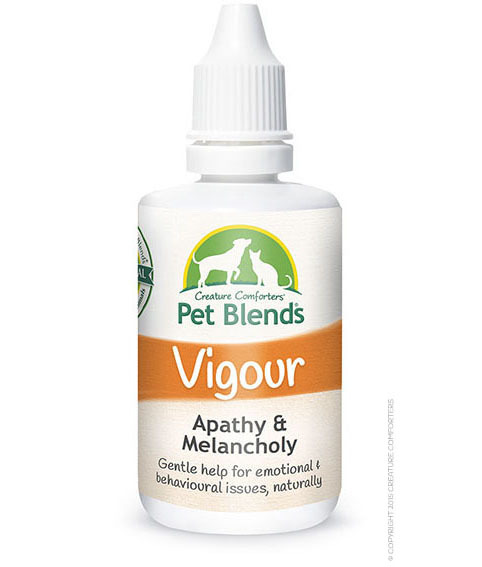 ​Five of our Pet Blends® (Comfort, Courage, Vigour, Mellow and Balance) should be given 3 times daily - until the bottle is finished - like a course of treatment. See instructions on label. Large animals, such as horses, will finish their bottle sooner (around 2 1/2 weeks) because they are given more drops in each dosage. 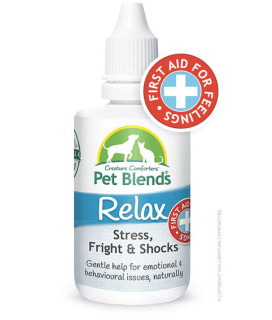 The 6th Pet Blend - 'Relax' does not have to be given every day. Usually only when needed. The Pet Blends® have a shelf-life of 2 years from when bottled. My dog seems to need 2 of the Pet Blends®, which one should I use? A: If your animal needs aspects of more than one of our Pet Blends® we would recommend a Personalised Blend for him/her, from our qualified Advanced Practitioner. ​Using a sample of your pet's fur, mane or feathers our Flower Essence Practitioner will make a special Blend with ingredients specially chosen to help address your pet's specific and individual emotional or behavioural needs. Consultations can be provided postally. Do I have to give my pet their Pet Blend forever? A: No. Usually one or two bottles, given in succession, is enough to improve their behaviour sufficiently. ​Some animals may need to have a few more bottles, in succession, this depends on the depth or complexity of their problem and, of course, if the correct Pet Blend has been chosen for them. Occasionally some animals may return to their old ways (their unwanted behaviours) over their lifetime. If so another course of Pet Blends® can be given. 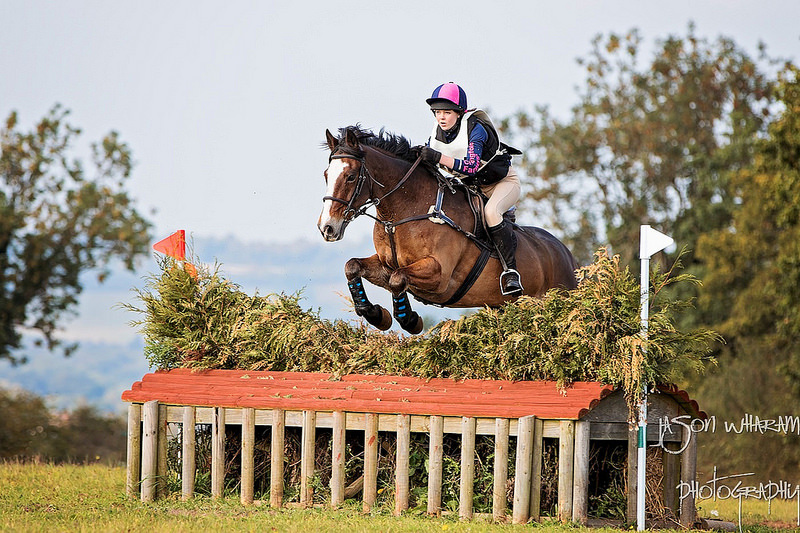 Some animals may benefit from a Personalised Blend - especially if they have complex problems (contact us for more details on Personalised Blends). For help choosing the correct Pet Blend please use our Pet Blend Finder. 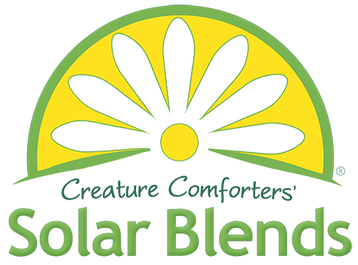 The Pet Blends® can be given indefinitely if you wish. They are gentle products. If you have given your animal a few bottles of the Blend, try easing off the drops (when the bottle is finished) to see if their behaviour is permanently improved. This will mean that they would no longer need to take the Pet Blend. If ever the behaviours return then you can start another course of Pet Blends®, or try a bespoke Personalised Blend. What are the Pet Blends® ingredients? A: They contain Flower Essences (MET of CCFE and Bach Remedies 0.2% ABV), spring water, food-grade vegetable glycerine (used as the natural preservative) - Kosher certified, Free from GMO. The Pet Blends® contain no artificial colours, flavours or preservatives. We use 100% chemical-FREE ingredients. Glycerine is a natural additive commonly given to dogs, cats, horses and cattle in their food, to help with their general health. To learn more about Glycerine please read this article by the 'Global Healing Center' > What is Vegetable Glycerine? ABV means 'Alcohol by Volume'. 0.2% ABV is a minuscule amount and is perfectly safe for animals of all types, breeds, sizes and ages. 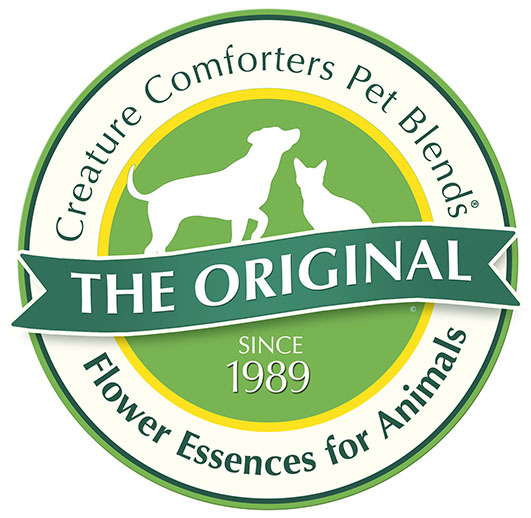 The Pet Blends® and Flower Essences have been safely used by hundreds of thousands of animals for many decades. Flower Essence MET is preserved in alcohol and 50% spring water, before being added as a few drops to the Pet Blends® bottle. For nearly 80 years people have given neat Flower Essences to animals which can be up to 36% ABV, therefore just 0.2% ABV in the Pet Blends® is an extremely insignificant amount. For example and as a comparison: significantly greater amounts than 0.2% ABV of alcohol can naturally occur in a human’s or an animal’s bloodstream through the process of digestion and fermentation of food . And fruit juices typically contain a naturally occurring ABV of 0.1% . There is little or no actual fibre of the Flower Essence plant in our Blends, it is the 'energy signature' of the plant - the pure 'Mother Essence Tincture' used as the active ingredient. To learn more about this, and how it works, please go to our Flower Essences Explained webpage. As with all remedies and medicines, keep out of reach of children. If symptoms persist please consult a veterinarian. Please store bottle in a cool, dry place away from direct sunlight below 77F. See full ingredients list and instructions on product label. Please note: the PDF file above does not open in a new window. Do professionals use the Pet Blends®? A: Yes. 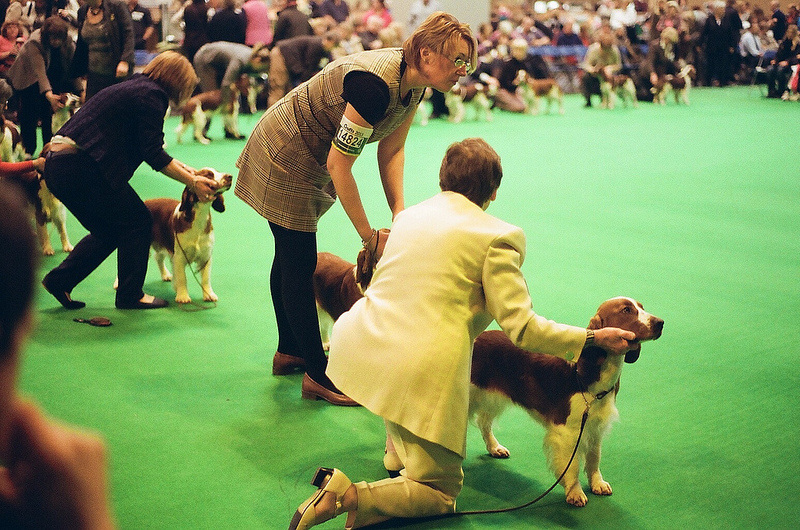 They are used by vets and veterinary nurses, animal trainers, rescue homes including the RSPCA, animal behaviourists, groomers and animal competition competitors. 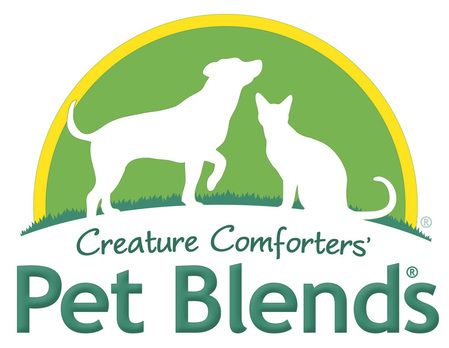 Will the Pet Blends® make my dog/cat/horse/etc. spaced-out? 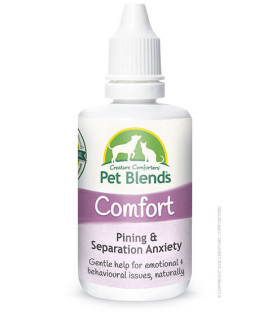 A: The Pet Blends® don't work like conventional sedatives, instead they are designed to naturally address the root of the problem rather than temporarily mask unwanted behaviours with sedation. 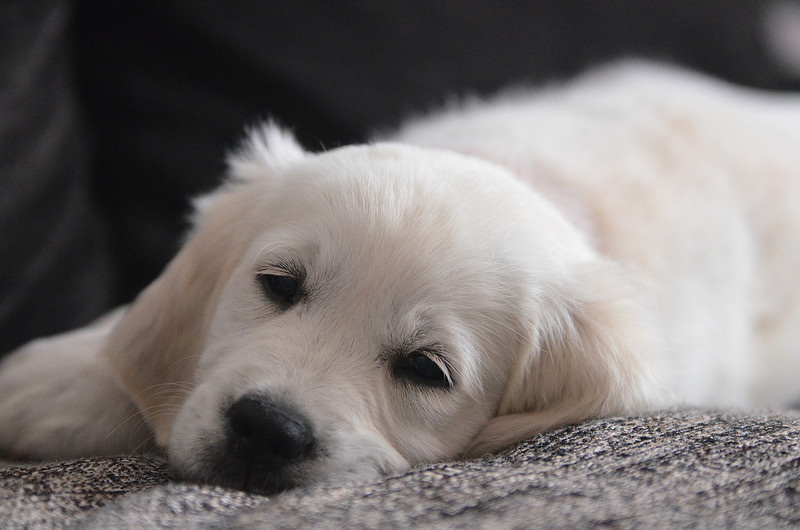 Can I give my pet 2 different Pet Blends® at the same time? A: If you think your pet needs 2 different Pet Blends® it is better for them to have a Personalised Blend - please go to our Consultations webpage for more details. 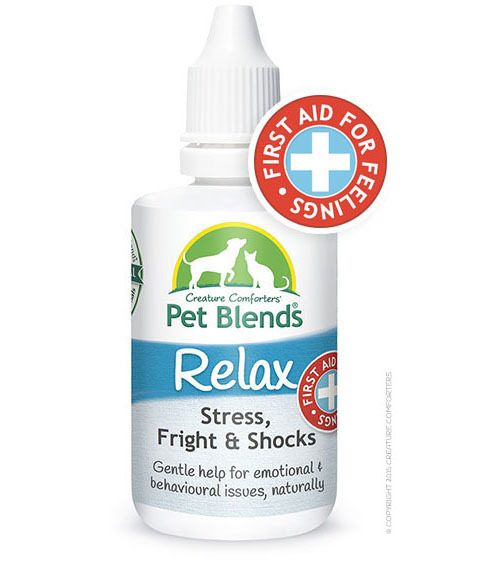 ​However, if they are on a course of one of the Pet Blends® they can also have the Relax Blend at the same time - as-and-when needed, for example in emergencies, for shocks and sudden traumas etc. Does it matter if another of my pets has some of a Pet Blend not intended for them? 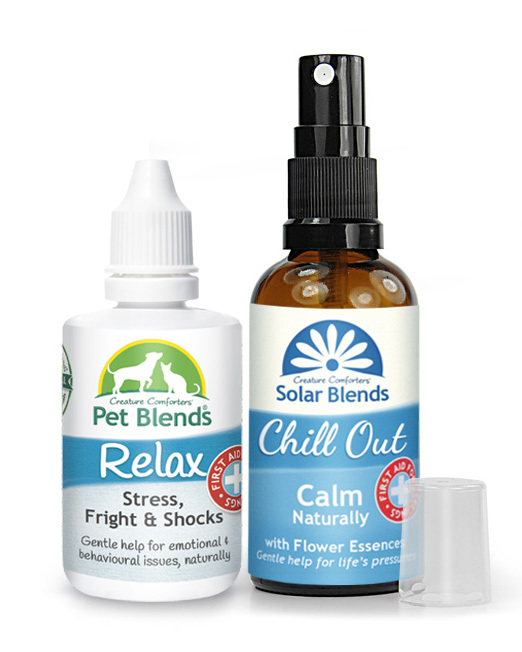 We use a carefully chosen combination of Bach Flower Remedies and other important Flower Essences (the 'CCFE') as the ingredients for our Pet Blends® and our Solar Blends. 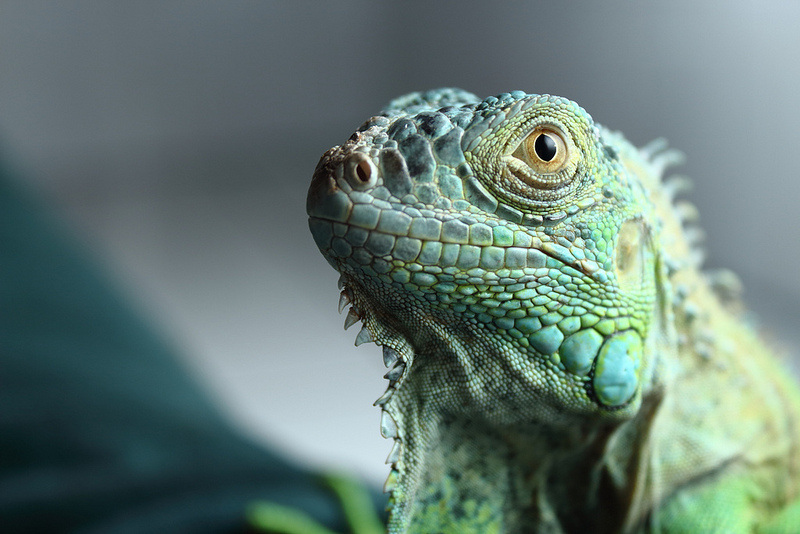 With decades of experience as Flower Essence Practitioners we have gained valuable knowledge on which Remedies and Essences are suited to which particular emotional or behavioural problem in our clients, be they people, or every type of animal such as dogs, cats, birds, horses, even llamas! The detailed case studies we have gathered over the years, and the thousands of clients we've helped, has enabled us to choose the optimum combination of Remedies and Essences ('Mother Essence Tinctures') as ingredients for our special Flower Essence Blends - the Creature Comforters® Pet Blends® and Solar Blends. They are for the six most common emotional and behavioural problems experienced by animals, such as for stress, nervousness, separation anxiety, apathy, anger, hyperactivity and training, and for four of the most frequently experienced transitory mood problems in people, such as feeling: stressed, low, down, weary, a lack of confidence or assertiveness and sleep stress. 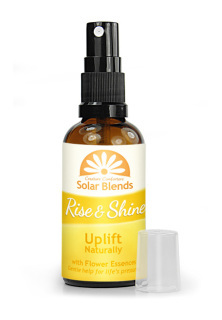 Our range of Flower Essence Blends are used to help soothe such problems in people and animals. They are natural, gentle, effective, easy to use and are suitable for people and pets of all ages. We make and bottle all our products by hand, there is no machinery, no conveyor belts, no automated robots employed in the making of our Blends, Essences and Remedies! Anyone who has a pet or works with animals knows that they can suffer with emotional as well as behavioural problems. They can experience a similar range of responses as us, such as fear, rage, jealousy, sadness and anxiety. That is where Flower Essences can gently help. Flower Essences have been used since the 1930s to help people with their own emotional problems (the most recognizable product being Rescue Remedy TM). However, now Flower Essences are widely used by vets, animal behaviourists, trainers and people with their pets to help promote balanced and well-adjusted behaviour in animals - in a natural way, without the use of chemicals. In orthodox medicine there is little help for animals in this area and the few conventional treatments there are can sometimes leave them with unwanted side effects such as drowsiness. This is where our flower essences are different because they can help to gently soothe an animal without masking their true nature. Our Pet Blends®, made using Flower Essences and Remedies, are specially formulated for use with animals and contain ingredients specially chosen to help address the specific problems unique to animals. At Creature Comforters® we have, over the past 25 years, reported an approximate 80% success rate with effectively addressing a wide range of challenging emotional and behavioural problems in animals. Importantly the 'Placebo Effect' is, of course, wholly extraneous with regard to animals. The small number of cases that the remedies are unable to address are usually helped by a change in circumstances/treatment and/or behaviour training. Also Flower Essence therapy can be a good support when used in conjunction with advice from a qualified animal behaviourist or by attending animal training classes - where appropriate. Many animal trainers recommend our products to their clients, especially for those animals who display behaviours which are difficult to solve with training alone. Flower Essence therapy can also be particularly beneficial for animals that have been traumatised by an event in their past, such as neglect, abuse, bad-handling or inappropriate treatment/training by previous owners. In complex cases such as this we recommend a consultation for a Personalised Blend. RELAX for Fear, Stress, Shocks etc. COMFORT for Separation anxiety, Pining etc. COURAGE for Nervousness, Timidity etc. VIGOUR for Apathy, Weariness, Sadness etc. MELLOW for Anger, Dominance, Volatility etc. BALANCE for Hyper, Highly Strung, Training etc. Relax Pet Blend® from Alice D - Riverhaze on Vimeo. Made Happy With Pet Blends® from Alice D - Riverhaze on Vimeo. We recommend the large 50ml bottle for large animals. Add to food, water and treats, as-and-when needed. Gentle, natural and effective. Suitable for all animals, young or old. The Pet Blends® don't have to be given forever! Usually one or two bottles, given in succession, is enough to improve your pet's behaviour sufficiently. Most owners observe improvement after administering one complete bottle (one bottle per animal). 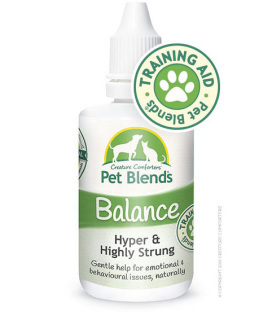 Many animals, particularly dogs, will also benefit from using the Pet Blends alongside professional training techniques plus a good healthy diet, rewards for good behaviour and plenty of exercise. Occasionally some animals may return to their old ways (their unwanted behaviours) over their lifetime. If so another course of Pet Blends can be given. Some animals may benefit from a Personalised Blend - especially if they have complex problems requiring individual attention (see below). 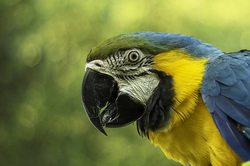 For any animals who don't show sufficient improvement from taking their Pet Blend™ this may be for a number of reasons, for example: the choice of Blend may not be quite correct for that animal’s problem, or the animal may additionally benefit from a change in circumstances, handling, environment, training etc. Furthermore, some animals may instead require a Personalised Blend for their individual problem. The Relax, Vigour and Comfort are best described as ‘Tonic’ Blends. This means that these Blends are usually used to help address problems/behaviours that are relatively transitory and/or acute, and are generally as a consequence of trauma/event/circumstance (and not ordinarily as a characteristic of the animal’s usual temperament). The Courage, Mellow and Balance are best described as ‘Constitutional’ Blends. 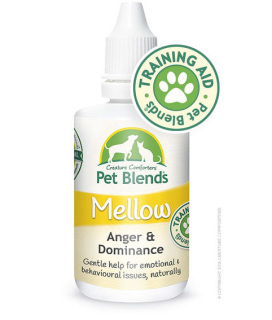 This means that, on the whole, these Blends are used to help address inherent temperament/behaviour traits. You can use our 'Pet Blend Finder' to help you choose the correct Blend for your pet. If you need further help please contact us by email with a description of your pet's problem. We are here to offer free expert advice. Please now check you have written your email address correctly. This is where we will send our reply. If you have contacted us by email we will reply shortly, often within a few hours, during office hours, and definitely within 24 hours (on business days). IMPORTANT: Please check your email inbox. If you cannot find our reply please check your email 'Spam' folder. If you find our email there, please ensure your email software knows it is not a 'spam' email. Move the email to your normal inbox, then all our replies will reach you. We frequently receive emails from customers about not having received any replies to their emails. We answer EVERY genuine email, so if you don’t get a reply from us it means either that your have written your email address incorrectly or that the email has been swallowed up somewhere along the line - in your email software! Therefore, please check all your mailboxes (spam, junk, trash etc. ), thank you. Or try contacting us again and writing your email address VERY carefully. The Chill Out! Blend can be beneficial for pet owners that need to calm themselves before entering the 'show ring' for example. 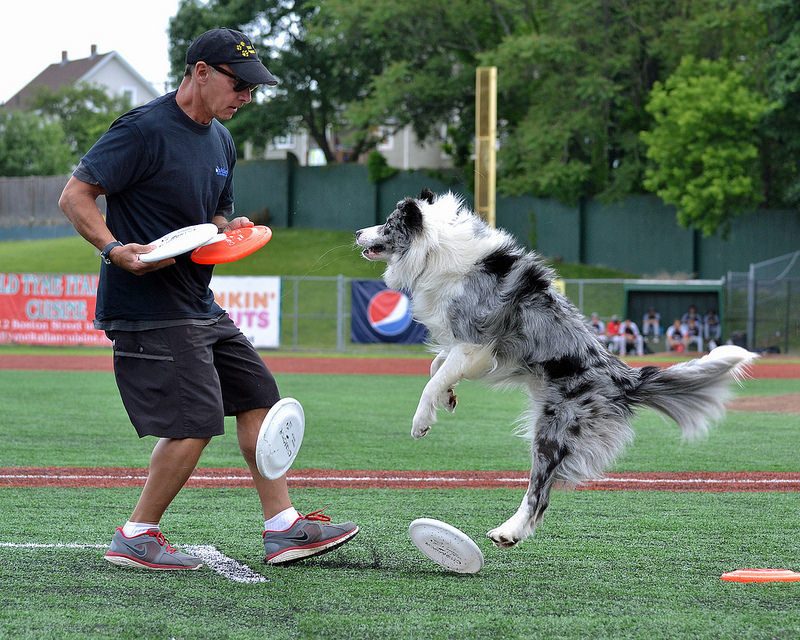 An owner's stress or nerves can sometimes negatively affect their pet's behaviour. 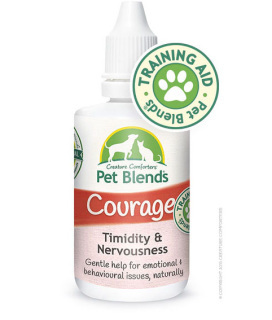 The Dutch Courage Blend can be beneficial for pet owners that need extra confidence before entering the 'show ring' for example. 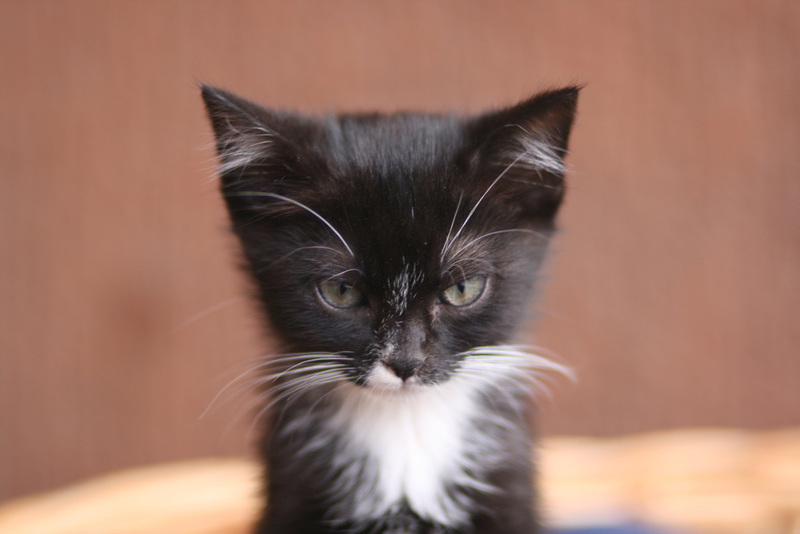 An owner's stress or nerves can sometimes negatively affect their pet's behaviour.